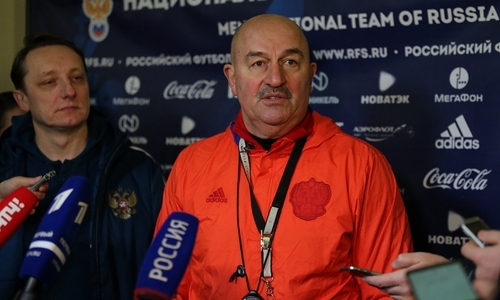 - Mr. Cherchesov, quite a few players will have to sit the camp out due to injuries. What do you think about this? - This does not make me happy for sure. But professional football and injuries go together. Quite a few players suffered injuries indeed but that is how things are. We cannot change anything about it and proceed based on who we have at our disposal. - Ari was invited to the Russian national for the first time. How did that happen? - We had a phone conversation yesterday to tell him to be ready to join the squad. And then we had another conversation today. He recalled that I was the first person in Russia who took note of him. So we have been monitoring him for quite some time. He has become a citizen of Russia and I would like to stress that that was his own decision. And we closely monitor all players who are eligible to appear for the national team, whether they play abroad or in the Russian Premier League. We had not initially planned to invite him to this camp but we needed a replacement as Artem Dzyuba suffered an injury. Ari showed a fine performance over the past few months so he earned this opportunity well. - How does it work when additional players are invited to the squad? - We monitor everybody closely. And when the final squad is announced, it is based on our list of candidates. And we know who can be a replacement in the event something happens. There were more injuries than usual this time. It is particularly sad that Ilzat Akhmetov was invited to the national team for the first time but suffered an injury. - What can you say about the injuries suffered by Zobnin and Petrov? - We examine all players who appear on the pitch. Unhealthy players shall definitely stay away from the pitch. They had a jogging session today and we will take a look at the dynamics tomorrow. The Russian Premier league gameweek just ended on Sunday and some of the players have minor injuries. So we will keep monitoring them. - Will they appear against Germany? - There is still time before the match on 15th of November. Artem Dzyuba was here today. He will be training individually and undergoing treatment for a few days. Then we will check the dynamics. - Did you examine the German national team’s lineup that was published a few days ago? - Yes, we know about the situation with the rival team. It was reported today that a striker suffered an injury (Mark Uth). We are aware of Germany’s lineup. We collect the information and analyse their matches. The weather in Leipzig is better than in Moscow so it will be easier for us weather-wise.